Chrome OS has been used by many people, and it’s becoming more popular since Chromebooks are mostly compact and very portable, one of them is the Chromebook 2 from Toshiba as mentioned here, so people who want to do their computing jobs on the go love to use Chromebooks as their second computer. The easiest method with the best result is using Cloud ready printers as listed in this page. But if you don’t have one of those printers, you can use your existing printer to print any documents in your Chrome OS based device. Google itself, already has the official guide page to print from Chromebook. 1. Your Windows or Mac or Linux computer so other device than your Chromebook. 1. Connect your Printer to your computer (Can be Windows/Mac/Linux computer, but not to the Chromebook). 2. You have your computer on. Chrome browser is installed, if it isn’t installed, you can install it from here. 3. Login to your Google account, if you don’t have one, create a new one. 4. 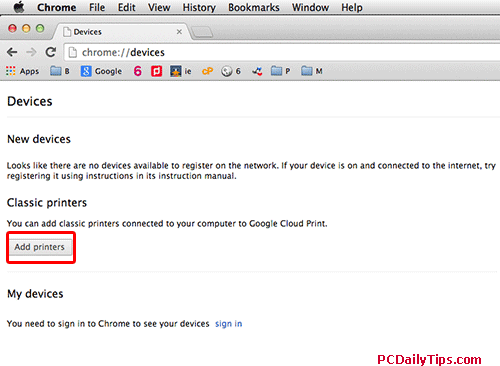 Then type (or copy this, without quotes) “chrome://settings/search#print” in your Chrome browser. Hit Enter key. You will see the “Google Cloud Print” Search result. After you paste the URL on the browser. You will see this page (in screenshot) if you haven’t set up a printer yet. If you never set up a printer before, this is what you’re going to see. 6. Click blue “Add Printer(s)” button. Click “Manage your printers” link. However it is possible that you will see “Add Classic printer” or “Add Cloud Ready Printer” options. Just ignore those, and click refresh button (red bordered in the image.) You will see the listed printer. Classic printer or Cloud ready printer option page – If you see this, click “Refresh” icon – red bordered. So we are done with the non-Chromebook computer cloud printer setup, now you can open your account in Chromebook, and make sure the account in your first computer is the same one with the account you are using in Chromebook. 2. Prepare your document, and click “Print” button/icon, or press your combo keys, Ctrl + P keys. You will be prompted to “Add a printer” if this is your first time attempt to print. 3. Now, on the right pane, under “Destination” click “Change” button. 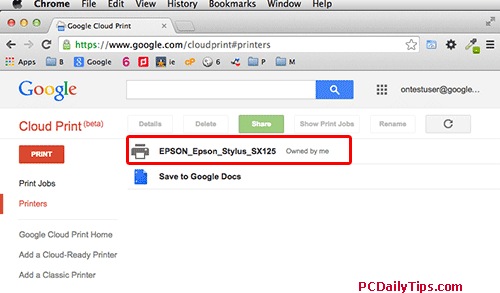 And under “Google Cloud Print” printers list, select the printer we’ve just added. Your printer that is connected with your non-Chromebook computer will print your document. If in case, you cannot print with the steps above even you are using the same account, try to set up your printer in your family member’s or a friend google account computer, and if it succeed, “Share” your printer using her/his account with yours. As shown in the video above in 59s.